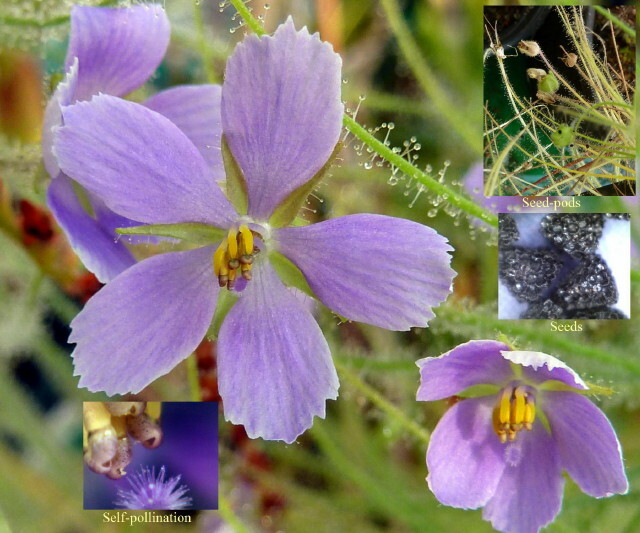 Here some Byblis liniflora Kingston Rest pics. All my pictures are without copyright. Those look exactly like B. 'Goliath' [filifolia]. Have you any closeups of the flowers? Have you tried self- pollination? I'm asking because it sure seems like a lot of Byblis "seed confusion" has been going on over in Oz. Here are some pics of the flowers.Don´t have tried self pollinating. Thank you very much for your fantastic photos! I love your plants and photos as always! They sure look like Byblis liniflora to me! The flower looks very similar to our F1-hybrid of B. filifolia x liniflora. The plant may be identified by its seeds, do you have a picture of the seeds? B. liniflora seeds are looking very different. Here is a photo with flower and seeds (published also in CPN). The F2 hybrids are still growing here, interestingly about 50% is sterile and the rest self-pollinating like B. liniflora. A report on the F2-hybrids will follow later this year. Sorry Siggi no picture of seeds for the moment.May be later. Here the picture of the seeds.I selfed the flowers.